Sometimes I come across an old dictionary or book that has been damaged or simply has several pages missing, and see that object as something that still contains a lot of information, AND, useful paper. I’d earlier crafted something similar to Pigasus that dealt with the theme “When pigs fly,” but wanted to step it up a notch. This will be the first in a series of Semi-Famous Barnyard Animals. Enjoy! 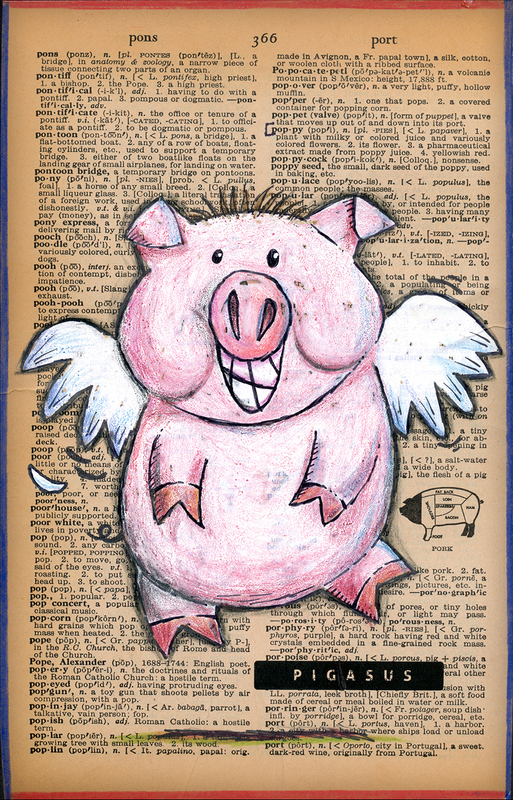 This entry was posted in Uncategorized and tagged animal illustration, dictionary, dogfoose, flying, michael kline, pigs, whimsical. Bookmark the permalink.